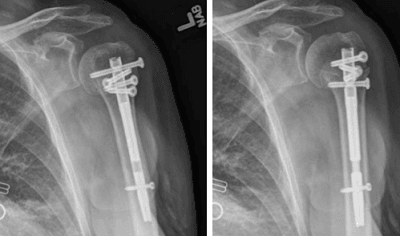 When a 66-year-old woman presents with a displaced 2-part proximal humerus fracture, the authors weigh the advantages and disadvantages of closed versus open reduction. Dr. Wong has no disclosures relevant to this article. Dr. Austin has disclosed that he is a consultant for Tornier. A 66-year-old female presented to the emergency department with significant left shoulder pain and swelling following a slip and fall on the ice. She was unable to move the shoulder due to the pain. Figure 1. Radiographs of left shoulder – AP in external rotation (top left), internal rotation (top right), and scapular-Y (bottom) – show a 2-part proximal humerus fracture at the surgical neck with approximately 50° of varus angulation. It is determined that open reduction and internal fixation with an intramedullary nail is the best option for this patient. The implant to be used is a humeral nail system for fracture fixation (Aequalis IM Nail; Tornier, Bloomington, Minnesota). This device is 130 mm long and has a diameter of 9 mm. It allows for 4 proximal interlocking screws and 2 distal interlocking screws. The distal interlocking screws can be placed either in a static or dynamic position. The authors generally place 1 distal interlock and utilize the static hole. The static hole must be used if retrograde compression is desired. 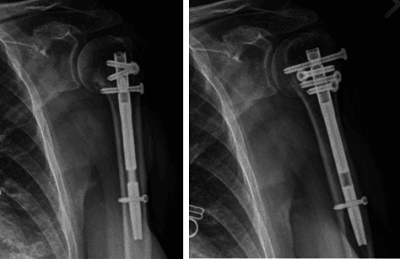 Fracture type: This fixation construct may be utilized for 2-, 3-, or 4-part proximal humeral fractures. Although the 2-part surgical neck fracture pattern is the prototypical fracture pattern for this device, the multi-directional proximal interlocking screws allow for secure fixation of the tuberosities in 3-part and 4-part fracture patterns. The 3-part and 4-part fracture patterns require more diligent work toward achieving provisional reduction of the fracture fragments with sutures and temporary K-wires prior to nail placement. The decision to proceed with an intramedullary nail over plate/screw fixation depends on surgeon preference. Head split fractures would be treated with arthroplasty. Age consideration: Older patients (more than 70 years old) with osteoporosis and a 4-part fractures may be better served with hemiarthroplasty or reverse total shoulder arthroplasty than with fracture fixation. Comorbidities: The intramedullary nail technique is ideal for patients with multiple medical comorbidities when the surgeon would like to minimize operative time. The patient is placed on a radiolucent table in the supine position with a bump under the scapula or in a low beach-chair position with the arm free. A C-arm is placed at the head of the bed to ensure that AP and axillary views can be obtained as needed. The affected arm is draped free, and bony landmarks of the acromion are marked. The arm is then placed in an arm holder (Figure 2). The incision is based from the anterolateral edge of the acromion distally approximately 5 cm. Dissection is carried down to the deltoid fascia. 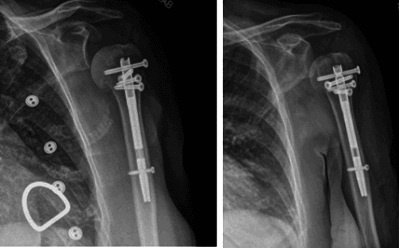 Temporary reduction and fixation of proximal humerus fracture fragments is performed with use of a periosteal elevator and K-wires (Figure 3, Video 1). 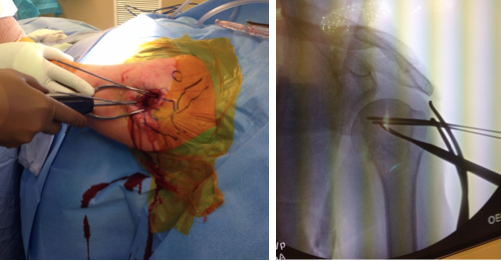 K-wire placement should not obstruct the medullary canal. The authors place 1 wire anterior and 1 wire posterior to the medullary canal so the wires can be maintained in place during humeral nail insertion. A supraspinatus split is created, with care taken to avoid disturbing the rotator cuff insertion onto the greater tuberosity. A starter awl is utilized to gain entry to the humeral head. The starting point is centered directly over the humeral shaft when the head is in the reduced position. This positioning is confirmed with fluoroscopy. A guide-wire is placed through the proximal hole, and then a 10-mm humeral reamer is utilized to open the humeral canal. Once this is done, the reamer is withdrawn. A proximal humeral nail is attached to a radiolucent targeting guide and then advanced into the humerus with a gentle twisting motion. The nail is advanced 5 to10 mm into the humeral head: 5 mm depth if no retrograde compression is planned; 10 mm depth if retrograde compression is planned. Figure 3. 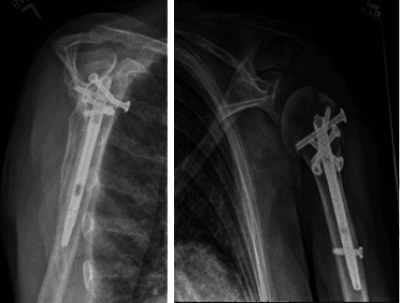 External (left) and fluoroscopic (right) views of the reduction maneuver with K-wires pulled distally and a Cobb elevator within the fracture site to lever the humeral head out of varus deformity. An attempt is made to reduce the medial calcar of the proximal humerus. Video 1. Reduction technique. 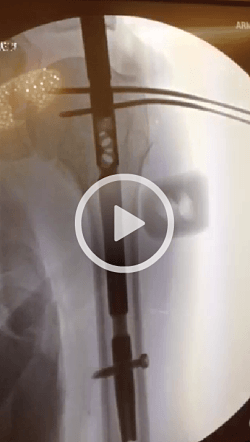 Fluoroscopic video of reduction technique with two 0.062 K-wires placed in the proximal humeral head. These wires can be utilized to control the head fragment and correct the varus deformity. The targeting guide has an attachment for a version guide to align with the forearm. Proximal first: The nail is placed at 5-mm depth in the humeral head. Distal first: The nail is placed at 10-mm depth in the humeral head, which allows for retrograde compression of the fracture site. Proximal screws are placed by inserting the drill sleeve/drill guide/trocar assembly into the targeting guide. Proximal screws are unicortical; depth should be confirmed fluoroscopically to ensure the articular surface is not breached. Distal screws, which are bicortical, are similarly placed using the drill sleeve/drill guide/trocar assembly through the targeting guide. Retrograde compression – see Videos 2 and 3. If compression at the fracture site is desired, the nail should be inserted to a depth of approximately 10mm, with the interlocking screws placed distally. 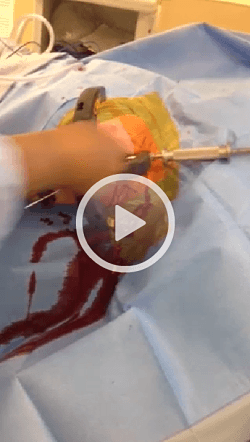 Gentle retrograde tapping of the insertion guide creates compression at the fracture site. After fracture compression is achieved, the proximal interlocks are placed. The targeting guide is removed from the nail once satisfactory interlock screws are placed and the position is confirmed fluoroscopically. Layered closure of the rotator cuff split and anterolateral deltoid raphe is done with absorbable sutures. Video 2. Fracture site compression (external). External view demonstrates the use of the back-hammer to provide a retrograde force to compress the fracture site. Video 3. Fracture site compression (fluoroscopic). 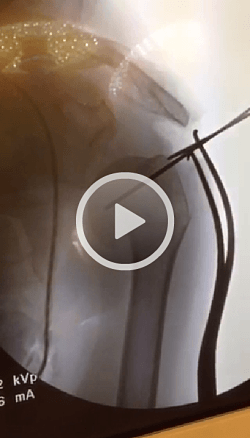 Fluoroscopic video shows the effect of retrograde fracture compression. Proximal screw fixation should be proximal to the axillary nerve, which travels posterior-to anterior approximately 5 to 7 cm from the lateral edge of the acromion. Arborizations of the axillary nerve occur in this region. If dissection is carried out into this region, care should be taken to identify the axillary nerve. Distal screw fixation is obtained with the targeting guide in a lateral-to-medial direction. In general, lateral-to-medial distal interlocking screws may place the radial nerve at-risk. The nail is 130 mm in length so the distal interlocks should be proximal to the point at which the radial nerve traverses from the spiral groove through the lateral intermuscular septum. At 2 weeks after surgery, the patient was tolerating passive forward elevation to 90° and passive external rotation to neutral. 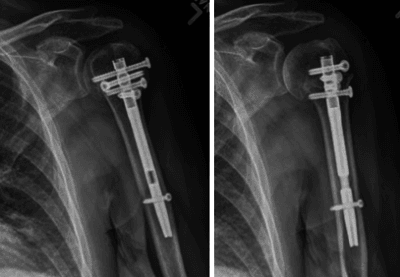 Radiographs show fracture alignment has been maintained, but the patient has developed pseudosubluxation of glenohumeral joint (Figure 4). 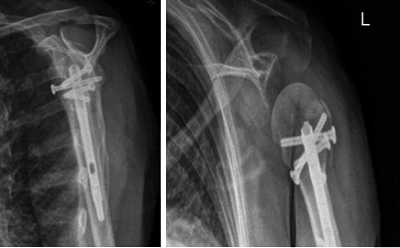 Pseudosubluxation after proximal humeral fracture refers to inferior subluxation of the proximal humerus on the glenoid, and it may be seen in 40% to 60% of patients after proximal humeral fracture fixation or arthroplasty for proximal humeral fractures. Pseudosubluxation can be related to shoulder hemarthrosis or transient deltoid atony, which may represent axillary nerve neuropraxia. 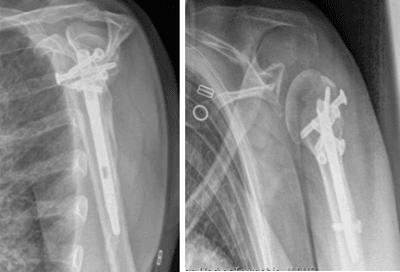 It is a self-limited condition that does not appear to be related to specific surgical treatment of proximal humerus fractures and generally resolves by 6 weeks after injury/surgery. Care is directed at support of the shoulder when in a dependent position and active assisted shoulder range of motion until muscle tone returns. Figure 4. Radiographs 2 weeks after surgery. At 6 weeks after surgery, the patient has achieveed active forward elevation to 110° and active external rotation to 40°. Radiographs show fracture alignment has been maintained and pseudosubluxation has resolved (Figure 5). Figure 5. Radiographs 6 weeks after surgery. At 3 months after surgery, the patient has achieved active forward elevation of 140° and active external rotation of 40°. 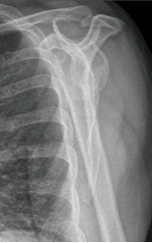 Radiographs demonstrate healed fracture (Figure 6). A month later, the patient has returned to unrestricted activity (Figure 7). Figure 6. Radiographs 3 months after surgery. Figure 7. Radiographs 4 months after surgery. Justin C. Wong, MD, is a PGY-5 orthopaedic surgery resident at the Thomas Jefferson University Sidney Kimmel Medical College in Philadelphia, Pennsylvania. Luke S. Austin, MD, is a shoulder and elbow surgeon with The Rothman Institute, Philadelphia, Pennsylvania. He is also an Assistant Professor of orthopaedic surgery at Thomas Jefferson University Hospital, Philadelphia, Pennsylvania.